Fall is here, and DIY and home improvement projects move in-doors. 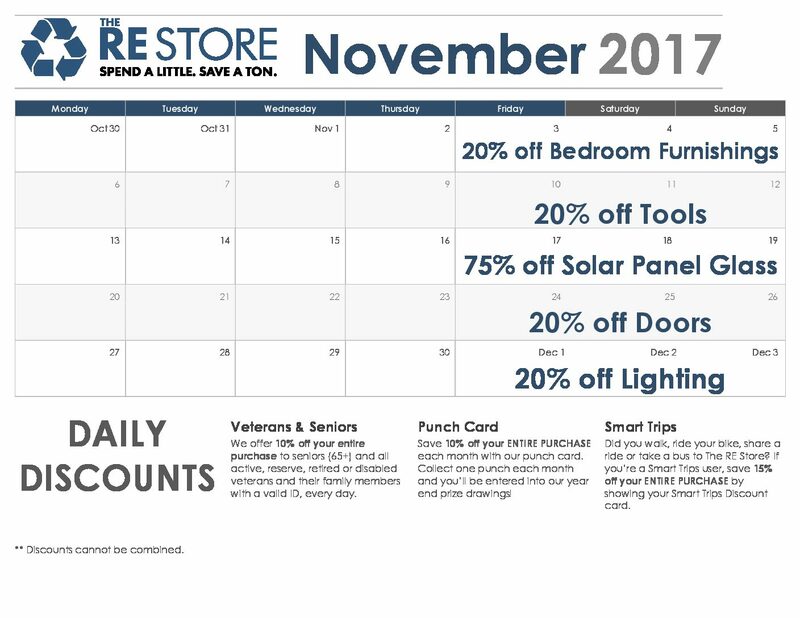 Save 20% on a variety of departments this month, including bedroom furnishings, tools, doors and lighting. If you’re looking for a new bed frame, window blinds, or bedroom furniture, we’ve got you covered. Update your interior or exterior door to provide more security and warmth to your home, or revamp your lighting for a cozy indoor space. If you’re like us and still working on cleaning up your yard before winter, save 75% on solar panel glass – a huge discount to help you finish up your yard. Veterans & Seniors – We offer 10% off your entire purchase to seniors (65+) and all active, reserve, retired or disabled veterans and their family members with a valid ID, every day. Punch Card – Save 10% off your entire purchase each month with our punch card. Collect one punch each month and you’ll be entered into our year end prize drawings! Smart Trips – Did you walk, ride your bike, share a ride or take a bus to The RE Store? If you’re a Smart Trips user, save 15% off your entire purchase by showing your Smart Trips Discount card. Valpak – Save $5 off a purchase of $25, or $10 off a purchase of $50 each month. Find your Valpak coupon in the mail each month. Chinook Book – Download the Chinook Book app and save $5 off a purchase of $25, or $10 off a purchase of $50 each month. Download today and start saving.